Research papers on death with dignity laws discuss the laws that allows for physicians to provide their terminally ill patients with lethal doses of barbiturate medications in order to help them end their lives. Oregon was the first state in the United States to establish an Act that allows for physicians to provide their terminally ill patients with lethal doses of barbiturate medications in order to help them end their lives. The act was established in Oregon in 1994 but only by a very slim margin. According to the law, individuals seeking the lethal medications must be residents of the state of Oregon and must be of legal age. They also have to be proven to be of sound mind by more than one doctor. In order for an individual to be eligible for the process not only must they be terminally ill, but also they have to have an estimated life expectancy of six months or less. In Oregon between the years of 1998 and 2010, 525 died by way of physician-assisted suicide. 82% of those individuals were battling terminal cancer. In Washington, the Initiative 1000 passed in 2008 established the state’s Death With Dignity Act. This established Washington as the second state in the United States to pass such laws. The law is based off those that were previously established in Oregon. In 2013, Vermont enacted their version of the Death with Dignity Laws and in 2016 California followed suit. Nationally there have been many debates on the moral and ethical ramifications of Death with Dignity laws. Those supporting the law believe the laws provide a compassionate solution for suffering individuals. Those who are opposed to the laws feel like groups of disenfranchised people are more likely to use the process if they feel they are burdening others or are suffering from depression or mental health problems. Currently the United States allows individual states to decide on their enacting of Death with Dignity Laws. 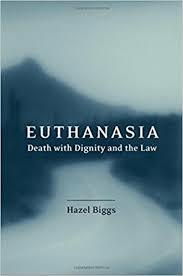 Assisted Suicide research papers explore euthanasia and a person's right to die. Paper Masters writes custom research papers on death with dignity laws and discuss the laws that allows for physicians to provide their terminally ill patients with lethal doses of barbiturate medications in order to help them end their lives.